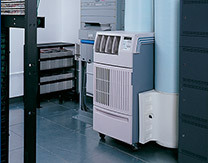 Home » Category archives "Home Improvement"
Thermal load – Determine the amount of cooling required for the server room. This is based on the thermal load of the equipment. There are labels with the thermal load on the back of each server. Alternatively, calculate the total wattage or get an electrical contractor in to determine the heat load and the BTU required. When spot cooling is an option, calculate the load per zone. Temperature – The ideal temperature for a server room is 70 degrees f. However, large data center operations run by companies like Google maintain much higher temperatures. The tradeoff here is on the lifetime of the equipment and redundancy. Except for large data centers, the method of cooling is not important as long as the temperature is maintained. It can be portable AC units or split types. Redundancy – There has to be a backup for whatever cooling method in use. The best solution is to have one or more portable AC units available for immediate use. This way any breakdown does have any immediate impact on operations. Servicing – Any air conditioning solutions should be easily serviceable. This is dependent on the size and the area immediately surrounding the room. This affects the placement and the type of AC unit. Look to MovinCool.com for your data center, industrial or spot cooling needs. Few things will have a bigger effect on our mood than the climate around us. Think about it: when the temperature spikes, you probably don’t feel much like moving. Even your thoughts may slow as you have a hard time focusing on anything other than how incredibly hot it is around you. In the past, this generally meant turning to the air conditioner and letting it do its thing. These days, though, relying on something as archaic as a fan coil unit to keep you comfortable just seems too outdated to be reliable. This is why so many people have moved to units with alternatives to traditional fan coils. Furthermore, you’ll notice an upward trend to those looking to use a rental portable air conditioner for the issue. By renting a unit, you don’t have to make a permanent investment. If you live somewhere with distinguishable seasons, you’re going to soon find that it’s only a matter of time before you no longer need that AC unit. It’s then you’ll be glad you can just return it and save your money. So the next time you find yourself in the mood for a slightly cooler habitat, check out what a rental AC unit can do, especially if it comes with alternative coils. There are countless reasons you may want portable air conditioners. No matter what they are, make the smart move by investing in MovinCool’s products. You’ll get a great price and the results you wanted. When most of us think of AC units, we tend to have some pretty basic pictures in our minds. Perhaps you think of central air, for example, or maybe your mind goes to the units that come out from the wall. In any case, these are definitely systems that are used to provide air conditioning, but they hardly scratch the surface anymore for what’s possible. Look at industrial cooling, for example. This is basically the same as air conditioning, but it’s done on such an extreme level that giant machines making a surplus of heat can actually be brought down to a reasonable temperature so they don’t end up harming themselves. This way, companies can use these machines around the clock—servers are good examples of this—without having to worry that they’re causing more harm than good. Then there is something like a portable dehumidifier. No, this isn’t air conditioning, but the main function it serves is very similar: it modifies the temperature in a room to such a degree that you no longer need to worry about whether or not the AC you’re trying to use will actually end up being a far costlier investment than you had expected. All this and more is now possible in the modern age of air conditioning. With a portable a/c, so much is possible. Whether you want a cooler home at a better price or you work with servers and it’s essential the temperature stay low, MovinCool has everything you need and so much more. A portable a/c must be stationed near a window or other opening from where it can release hot air while drawing in cooler air. They can also be placed near a wall hole created for the purpose. One advantage is that you can also look at a rental portable air conditioner. You can also get a portable dehumidifier. Window air conditioners sit on top of a window frame with their exhaust systems oriented toward the outside. They have an air return system that releases cool air into the room. This is useful if you want to be able to put an a/c in without breaking any walls or making any holes. Through the wall air conditioners are just like Window air conditioners except that they are fitted through a wall instead of through a window. This requires professional installation and involves making a large rectangular hole in the wall. Ductless mini split systems offer a more quiet and efficient air conditioning solution. The condenser unit is outside and the small blower unit is installed inside. This also requires installation. A small hole is required in the wall for the pipe to the outdoor unit. There is another type called Package Terminal Air Conditioners that are made for heavy duty commercial work and are not something that you would use at home. 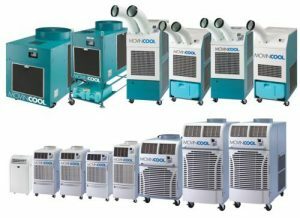 MovinCool specializes in AC units for various indoor and outdoor cooling needs including portable a/c and data center cooling. Founder of Facebook Technology Is Finally Tie The Knot!